In 2009, Ms. O’Connor became the first nurse in Canada to complete the Commonwealth Fund Harkness Fellowship in health policy and practice. One of 15 fellows from six nations, her goal was to study organizations that had been highly successful in introducing innovations in interdisciplinary work redesign. The fellowship provided me an opportunity to conduct three case studies in the U.S. and in Canada to examine key contextual elements and strategic change processes involved in adopting and sustaining innovation, and their impact on outcomes. In other words, how do successful organizations make it happen? Among them was ThedaCare in Wisconsin that had introduced a collaborative care model in inpatient care. It was one of the 13 original test sites for the Transforming Care at the Bedside (TCAB) program developed by the Institute for Healthcare Improvement. TCAB engages frontline staff in leading process improvement efforts to improve patient outcomes and the work environment. Inspired by what I saw, it was time to apply the lessons learned at the MUHC. The first step involved gaining support at the MUHC to begin implementing TCAB on five inpatient units. Our aim was to understand care through the eyes of patients, and to engage patient representatives and staff in co-developing new work processes that eliminate waste and duplication. Patient representatives, recruited from MUHC Patient Committees, were trained alongside five interprofessional teams in rapid-cycle improvement processes (Plan-Do-Study-Act) and LEAN methods, testing and evaluating improvement ideas. Improvements in the physical environment aimed at reducing “hunting and gathering time” led to significant efficiency gains. Relocating blood pressure machines and bladder scanners into well-marked “parking lots” (see photo below) saved thousands of hours a year, allowing nurses to spend more time at the bedside. And test cancellations caused by the inability to find wheelchairs were eliminated. In mental health, the team abandoned their “silo” approach whereby each discipline conducts a separate admission interview, obliging patients to see three or four different people sequentially on the same day, in favour of a joint interprofessional interview. That transformed a 4.2-hour process into a 45-minute process, with 15 minutes left over for the team to develop a joint care plan with the patient. 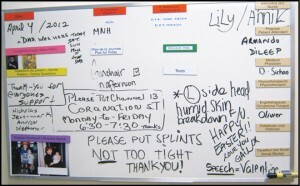 Whiteboards (see image) were introduced at the bedside as a two-way communication tool, listing the names of the care team, and the expected date of discharge, and providing space for the patient and family to record their concerns/questions and leave important notes to each other. These have been so successful that the MUHC Patient Committee spent $40,000 to ensure we had really good boards. A quiet zone created on a neuro-surgical unit reduced medication interruptions by 50%, and medication transcription errors by 60%. The redesign of a gynecologic-oncology chemotherapy unit reduced the wait to start chemotherapy by 57%. Overall, we have seen an 8% increase in RN direct time in care, a 50% reduction in waste and statistically significant reductions in overtime and turnover. Having introduced first-time measurements of patient experience of care at the MUHC, we have seen a 20% improvement in ratings of responsiveness and a 10% improvement in medication communication. Looking beyond our own walls brings new ideas for improvement, but it also takes steadfast support from our home institution and its leaders to integrate these innovations into current practice. Grant support from the following has also been critical: the Canadian Foundation for Healthcare Improvement, the Québec Ministry of Health, the Max Bell Foundation, the Newton, Roasters and Montreal General Hospital Foundations. Three new units are implementing TCAB now, with eight more to come in 2013 to 2015.